Finkelstein, Maxwell W.. "Vuntut National Park". The Canadian Encyclopedia, 25 January 2018, Historica Canada. 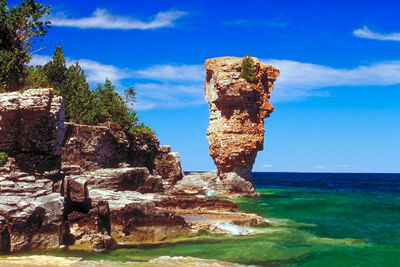 https://www.thecanadianencyclopedia.ca/en/article/vuntut-national-park. Accessed 25 April 2019. A portion of the Old Crow Plain (locally called the Old Crow Flats) was set aside, through the settlement of the Vuntut Gwitchin comprehensive land claim in 1993, for Vuntut National Park (established 1995, 4345 km2). Vuntut National Park contains a part of the Porcupine caribou herd's migration route and their wintering grounds (photo by W. Lynch, courtesy Parks Canada). A portion of the Old Crow Plain (locally called the Old Crow Flats) was set aside, through the settlement of the Vuntut Gwitchin comprehensive land claim in 1993, for Vuntut National Park (established 1995, 4345 km2). 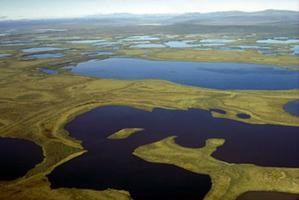 The park is bound to the north by Ivvavik National Park and to the west by Alaska. Access to Vuntut National Park is by charter aircraft from the village of Old Crow, which only has year-round scheduled air service, or by a long canoe journey. 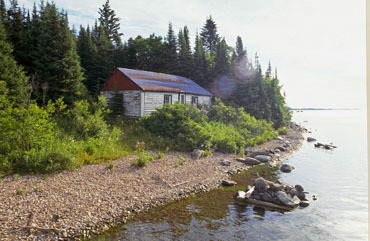 The Old Crow Flats is a plain rimmed to the north by hills and mountains. 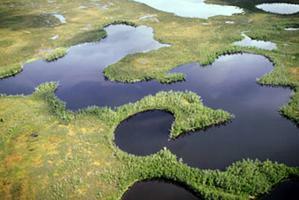 Thousands of lakes dot the landscape, a water-maze of peat bog. These wetlands are a designated Ramsar Site (1982), ie, a wetland of global significance, and support hundreds of thousands of waterfowl during the short summer, for breeding, moulting and staging. In addition to waterfowl, the area also supports vast numbers of muskrat. 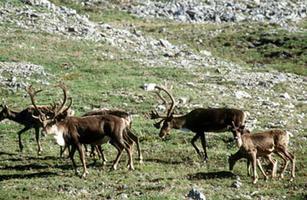 The Vuntut Gwitchin depend on the Porcupine caribou herd for their culture and livelihood. 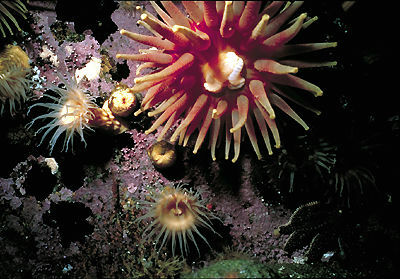 This large herd migrates over a vast area of northern Yukon and Alaska. Caribou migration routes and part of the herd's calving grounds are protected in Canada by Vuntut and Ivvavik national parks. The area escaped glaciation in the Pleistocene so it has a rich and varied palaeontological and archaeological record stretching back nearly 40 000 years. The undisturbed fossil beds, one of Canada's most important sources of vertebrate fossils, offer a rare opportunity to look at climatic and environmental changes between the glacial epochs of the Pleistocene and modern times. Artifacts show evidence of very early human habitation (see alsoOld Crow Basin). The Vuntut Information and Operations Centre highlights the natural and cultural treasures to be found in Vuntut National Park and elsewhere in Vuntut Gwitchin traditional territory.